The Fed: Up to its Earmarks in Gold Price Manipulation? Testifying before Congress in mid-1998 on the subject of over-the-counter derivatives, Fed Chairman Alan Greenspan set off a minor fire storm in the gold community when he observed: "Nor can private counterparties restrict supplies of gold, another commodity whose derivatives are often traded over-the-counter, where central banks stand ready to lease gold in increasing quantities should the price rise." In a letter dated January 19, 2000, to Senator Lieberman (Dem., Conn.) responding to questions posed by GATA, Mr. Greenspan affirmed that the Fed owns no gold and does not intervene in the gold market. Emphasizing this point, he wrote: "Most importantly, the Federal Reserve is in complete agreement with the proposition that any such transactions on our part, aimed at manipulating the price of gold or otherwise interfering in the free trade of gold, would be wholly inappropriate." Further explaining his prior statement to Congress, Mr. Greenspan added: "The observation simply describes the limited capacity of private parties to influence the gold market by restricting the supply of gold, given the observed willingness of some foreign central banks -- not the Federal Reserve -- to lease gold in response to price increases." Subsequently, on March 29, 2000, Mr. Greenspan wrote to Congressman Ron Paul: "I don't know if I will be able to end speculation about U.S. involvement in the gold market, but I can say unequivocally that the Federal Reserve Bank of New York has not intervened in the gold market in an attempt to manipulate the price of gold on its own behalf or for the U.S. Treasury or anyone else." What is immediately apparent from this chart is that disbursements of gold from the earmarked accounts of foreign central banks and other foreign official agencies at the N.Y. Fed, shown in blue, are included in exports of nonmonetary gold as reported by the Commerce Department, shown in red. 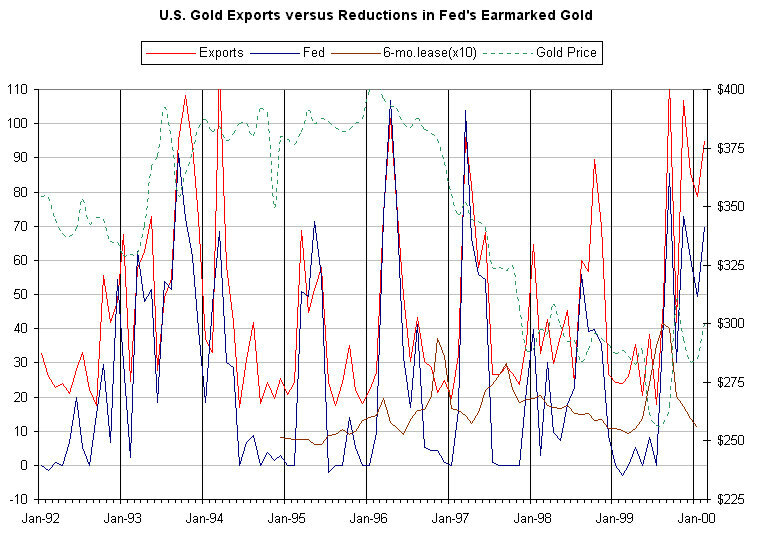 Plainly there is no realistic sense in which these withdrawals of foreign official gold from the Fed are U.S. exports. Possibly they are reported this way by mistake, perhaps reflecting the fact that nonmonetary gold cannot be distinguished from monetary gold at the points where exports are measured. Intentionally or not, the effect is to gild the export numbers, making the trade balance appear better than it is. * In $millions valued at $42.22/oz. Total Fed outflows in the 1995-1998 period were 1245 tonnes. Well-publicized large official sales over the same period were 1269 tonnes. In 1995-1997, large sales at the beginning of the year roughly correspond to the big spikes in Fed outflows in the same years. So one relatively benign explanation for these Fed outflows is that they reflect official sales decided upon by foreign central banks with no coordinated design to influence gold prices. But is that the only plausible explanation, or has Mr. Greenspan suggested another? In prior commentaries, I have hypothesized that any coordinated, large-scale official scheme to cap the gold price probably began in 1995 with the severe worsening of the Japanese economic crisis, continued through 1998 with the support of the major industrial nations, and then ran into European resistance after the successful launch of the euro in 1999. See generally Two Bills: Scandal and Opportunity in Gold. With the Europeans stepping back from further participation and plans for gold sales by the IMF going awry, the remaining gold price manipulators under American leadership were forced to resort in desperation to British gold sales, provoking European retaliation in the form of the Washington Agreement. Reductions in gold in the foreign earmarked accounts at the Fed could just as easily represent leased gold as outright official sales. Indeed, leased gold exported from the U.S. by the private bullion banks who leased it might be more easily mistaken for nonmonetary gold exports than official gold sales, which often go directly to other official agencies. The volume of Fed outflows, around 1250 tonnes in the 1995-1998 period, is as consistent with leasing as with sales. This amount is about the same as the proposed Swiss gold sales, which in a prior commentary I suggested might be aimed at covering a roughly equivalent amount of gold previously leased by European central banks. Obviously it is impossible to tell from the Fed's numbers whether the gold outflows from its foreign earmarked accounts represented gold for lease, outright sale or some combination of the two. But, taking Mr. Greenspan at his word, as of mid-1998 foreign central banks had in the past and stood ready in the future to lease gold into rising prices. This reason for leasing, of course, is not that ordinarily given by central banks, who claim that it is principally a means to earn income on an otherwise sterile asset. Looking at the chart, which shows lease rates in brown, there does not appear to be any significant correlation between lease rates and Fed outflows. In this chart, Fed outflows for each month are spotted at the end of the month, as are U.S. exports of nonmonetary gold. For technical reasons, average monthly gold prices, which ought to be spotted mid-month, must be put at the beginning of the month. However, to provide accurate reference to gold prices, they are plotted daily in the top section of the chart. When the Asian financial crisis first broke in early 1997, Fed outflows initially surged into relatively high and strong gold prices. As it became apparent that the Asian crisis would not only dampen demand for gold in an important market but also precipitate some distress selling, gold prices began a sustained decline into the beginning of 1998. Fed outflows also declined and ceased. 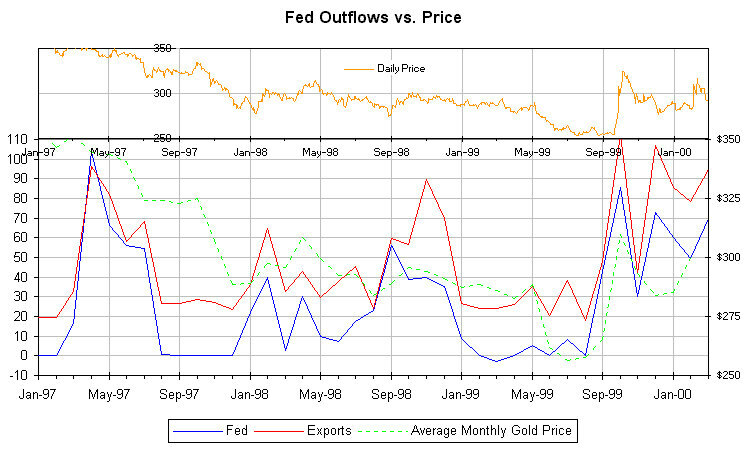 With the recovery of gold prices in early 1998, Fed outflows again picked up, showing small spikes with each rally. In 1995 and 1996, a similar pattern of otherwise quiescent Fed outflows spiking upward with gold price rallies is shown on the first chart. When the Russian default and Long Term Capital Management fiasco struck in the fall of 1998, gold prices and Fed outflows again surged together. But then something strange happened. As gold prices continued their upward advance, Fed outflows fell back. But total U.S. gold exports, in amounts far in excess of ordinary monthly levels of around 25 tonnes, still spiked into the rising gold prices. Where did this gold, emanating from the U.S. but not from foreign earmarked accounts at the Fed, come from? One obvious suspect is the Exchange Stabilization Fund, which also has a gold account at the N.Y. Fed and thus, assuming it had the gold, could have released it into the market through substantially the same channels as previously utilized for foreign earmarked gold. The ESF may also have had an additional motivation at this time. Impeachment proceedings were moving into full gear, and any serious financial disturbance might easily have been fatal to the Clinton presidency. Where might the ESF have obtained some gold. When the Asian financial crisis hit Korea in late 1997, there was speculation that the Exchange Stabilization Fund might intervene with some sort of support package, although whether it did so has never been confirmed. Korea's own "Save the Nation" campaign took in about 200 tonnes of gold volunteered by its citizens. Accordingly, it is possible that the ESF bought or otherwise obtained some or all of this gold as part of a rescue package, and thus had it available in the U.S. in 1998. Two other points bear on this theory: (1) most of the Korean gold must have been scrap, and therefore in need of some recycling, which could have been done in private U.S. refineries and/or through the government's own gold recycling program; and (2) this sort of activity could also explain the one time entry for commissions that appeared on the ESF's third quarter 1999 financial statements. Wherever the gold came from in the fall of 1998, by the end of the year gold prices were comfortably under control well-below the $300/oz. level. Here they rested until April 1999, when increasing doubts surfaced regarding the ability of the IMF to secure the required approvals for its proposed gold sales. Gold prices began to rally, closing near $290 on May 6, and threatening the $300 level. At the same time there was just the tiniest blip upward in outflows of foreign earmarked gold from the Fed and total U.S. gold exports. Apparently these sources, including the mysterious gold that appeared during the previous fall, were tapped out. Then, on May 7, 1999, Her Majesty's Treasury intervened with its yet to be explained and totally unexpected announcement of gold sales. British gold reserves are under the jurisdiction of the British Treasury's Exchange Equalisation Account, which was the paradigm for the ESF. Out of gold, either from its own account or from foreign earmarked accounts, the ESF may simply have executed a hand-off of the gold control ball to the EEA. The British announcement sent gold prices into a steep slide, but the European central banks were far from supportive. On September 26, 1999, they announced the Washington Agreement. In the gold panic that followed, some foreign official gold was obtained from accounts at the N.Y. Fed. This gold, apparently unavailable in May, was thrown at spiking gold prices. Whatever extra gold that could be found in the U.S. was tossed into total U.S. exports. But these supplies were far from sufficient to meet the demand from panicked shorts, and the newest form of alchemy was pressed into service without restraint: paper gold, a/k/a gold derivatives. In the last half of 1999, Citibank, former Treasury Secretary Rubin's new firm, increased the total notional amount of its gold derivatives by over 60%, from $7.2 billion to $11.8 billion. But among U.S. commercial banks, Citibank is a distant number three in this business. It could not fill the burgeoning demand. So the ESF and the Fed were forced to go where the Treasury used to go before the Fed succeeded J. Pierpont Morgan in 1913 as the last resort in a U.S. financial crisis. Spouting gold derivatives in abundance, the House of Morgan spooked the longs and gained a reprieve for the shorts. Time was when a true Morgan rescue with real money marked a turning in the financial tide, and Morgan remained on the scene to guide the recovery. But as John Hathaway notes in his new essay, JP Morgan To The Rescue, www.tocqueville.com/brainstorms/brainstorm0064.shtml (alternate link: www.egroups.com/message/gata/453), at the end of 1999 Morgan shutdown its New York gold trading operations and moved them to London, conveniently close to the British Treasury and further from the view of U.S. regulators. Whatever Mr. Greenspan may have intended to convey about the risks of gold derivatives and the knowledge or participation of the Fed in any scheme to control gold prices, he has not painted a very accurate picture of the true situation. Indeed, the notion that central banks possess a general power through leasing to control gold prices over the longer term is not just mistaken but dangerous. It is a prescription for a gold banking crisis. This subject will be addressed in my next commentary, together with the possible connection of the Swiss gold sales to the activities hypothesized in this commentary and dramatized so well by Elwood's charts, for which I again express my sincerest thanks.